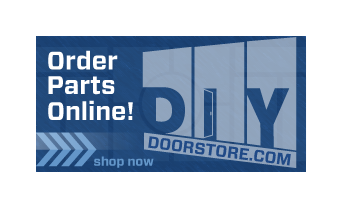 Repairing your garage door springs can be done in an easy 4-step process. If your car is stuck inside the garage, you’ll need to get it out of there. Pull the red emergency release cord located above the door to enable you to manually lift the door. Be careful, the garage door will be heavier than you expect because the spring is what makes the door much easier to lift. If it’s too difficult to open yourself have a neighbor or a family member help you. If you drop the door, please don’t try to stop it with your foot. Identify which type of garage door spring you have: Extension or Torsion. A torsion spring runs across a bar at the top of the inside of the garage door. The spring is wound and under immense tension. It’s the tension of the torsion spring that lifts the weight of the garage door. An extension spring is on either side of the door, perpendicular to it. These springs act like big, steel rubber bands. They stretch as the garage door is lowered. The natural tendency of the stretched spring is to lift the door. Torsion and extension springs exert a force equal to the weight of your garage door. This counter balances the 200 to 300 pound garage door, rendering it weight neutral so it can be easily opened. If your garage door springs break you can still manually open the door, you just need to exert that much more force to open it. Now that you know what type of spring you have you need to purchase new ones. You’ll want to replace all of your garage door springs at the same time. Typically garage door springs are installed at the same time. Having undergone similar aging and weathering, one broken garage door spring is a sign that the second one will soon break too. Of course you could wait until the other spring breaks, but then you’ll need to go through the hassle of repairing a broken spring again. Additionally, having a new and old spring on your garage door throws off the balance of the door. You can find springs as your local hardware store such as Home Depot. Prices will vary. The process of changing the springs is very detailed. For a detailed tutorial and some videos give a Google search for the process. This is a serious job that requires a good deal of time and patience. These springs are wound under pressure, you will not want to try to rush through this process. 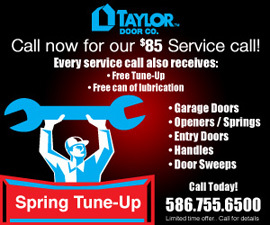 Most people don’t have the time or inclination to replace their broken garage door spring themselves. If you decide to tackle the job yourself, please be careful and do full research before starting. An extra hour of reading will more than make up for the frustration and pain if you make a mistake. 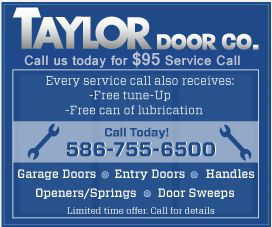 You can definitely give the professionals at Taylor Door Co. a call and set up an appointment or repair advice at 1-800-734-0979.